I came up with the idea for this dish when I was desperately hungry in the grocery store tonight at 8 p.m. after a yoga class that nearly was the end of me. I planned on making sauteed grouper but of course by that time at night the seafood counter was down to one last sad fillet that was not coming home with me. I picked up a few organic chicken breasts and decided to make Brie and Apricot Chicken with Almonds. Then I realized that I didn’t have apricot preserves and brie was going to run me at least six dollars. I started brainstorming ideas for what I could make with what was in my fridge. And that’s how these delicious Sauteed Greek Chicken Breasts were born. 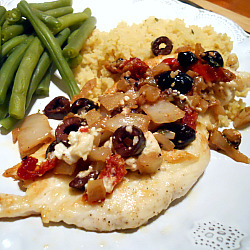 I had all the ingredients on hand at home to make a Greek-inspired chicken dish. Rather than stuffing the chicken breasts, I took the lazy way out and made a tasty topping. It worked perfectly. The topping added so much flavor to the chicken. I pounded the chicken out thin to ensure that it cooked quickly, evenly and stayed tender and juicy. I served the chicken with quick cooking couscous and green beans. This was a very simple meal for a weeknight that was on the table in less than 20 minutes. Both of us really enjoyed this dish and I will be adding it to my quick weeknight dinner repertoire. Place chicken in a large Ziploc bag or between two sheets of wax paper and pound to about 1/4-inch thickness. Season with salt and pepper, to taste. Pour flour into a shallow dish and season with salt and pepper. Dredge chicken in the flour and shake off excess. Heat a large nonstick skillet over medium to medium-high heat. Add olive oil and heat until shimmering. Place chicken in oil and saute about 3-4 minutes per side, or until golden brown and internal temperature is 160 degrees. Remove chicken from skillet and let rest on a plate, loosely covered with foil. Add onion to skillet and saute for about 4-5 minutes, stirring frequently. Add garlic, olives and sundried tomatoes and cook for another minute or two. Add broth and a squeeze of lemon and stir, scraping up brown bits from the bottom of the skillet. Cook until most of the liquid has evaporated. Stir in fresh herbs and feta and spoon mixture over chicken.